We were on curvy Hwy 72 west of Millersville when we got behind a piece of farm equipment doing about 10 miles per hour. 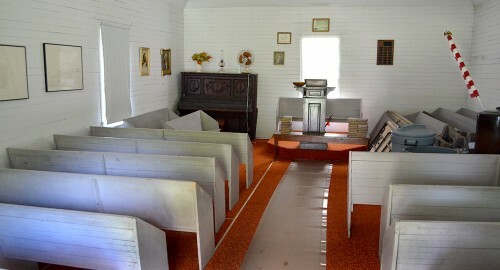 After following him for a couple miles, I welcomed a chance to pull off at a neat white church and well-kept cemetery. I figured by the time I had explored the place he would be far ahead or have turned off. 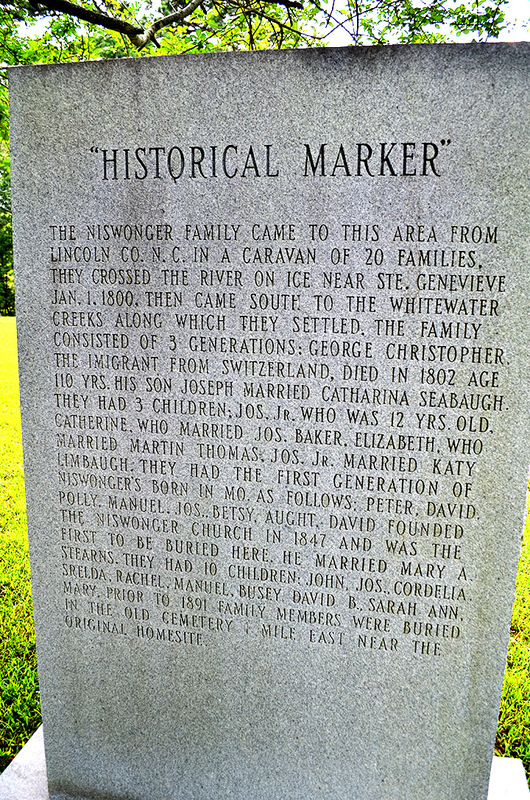 Right at the entrance to the driveway is a marker that tells how the Niswonger family came to these parts from North Carolina and how they crossed the river on ice near Ste. Genevieve on New Year’s Day 1800. One of the party, George Christopher, was 110 years old when he died in 1802, it said. You can click on the photos to make them larger, but I don’t know if you’ll be able to read the marker. The back side of the marker has some corrections that were added in 1996. 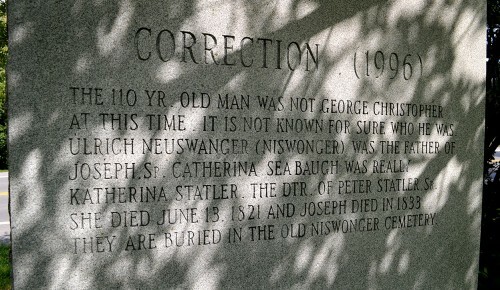 Apparently the 110-year-old man WASN’T George Christopher. They aren’t exactly sure WHO he was. They also cleaned up some other details at the same time. Someone is doing a great job at keeping the building and grounds in good condition. 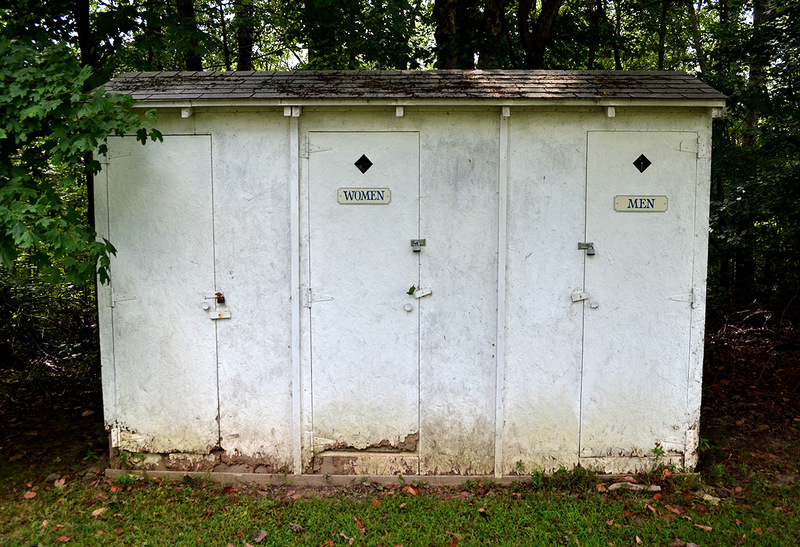 Behind the church is a row of three locked outhouses. 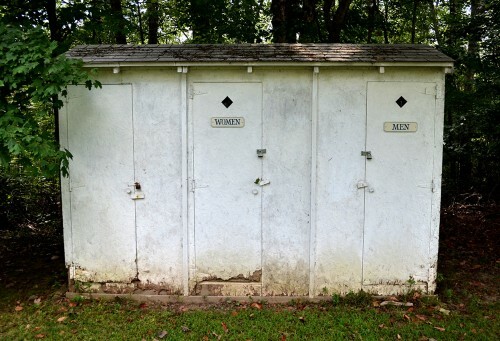 One is marked “Men,” one says, “Women,” and the third doesn’t say anything. I’m not sure who it is intended for. I didn’t hold out much hope that the church would be open – I mean, they put locks on the OUTHOUSES. Still, the front door swung open at a gentle pull. I left it open behind me after remembering how the Methodists tried to hold me hostage in the McKendree Chapel. 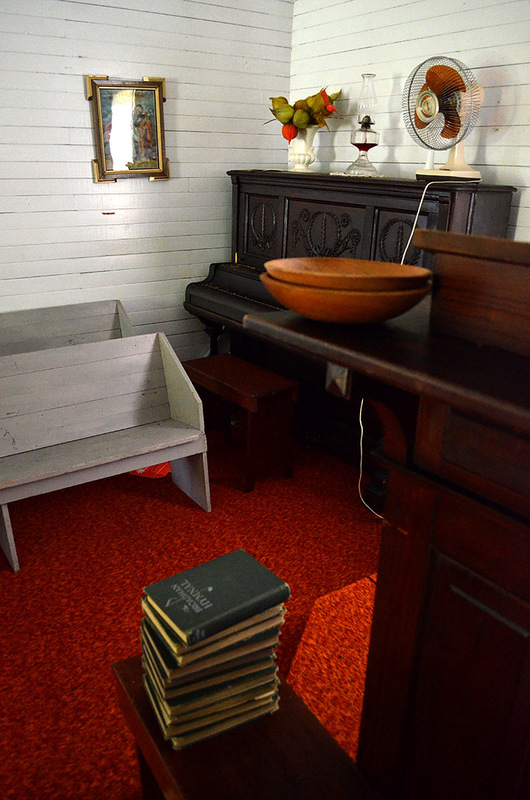 Hymnals, collections plates, the piano and an electric fan were at the ready for the next service. 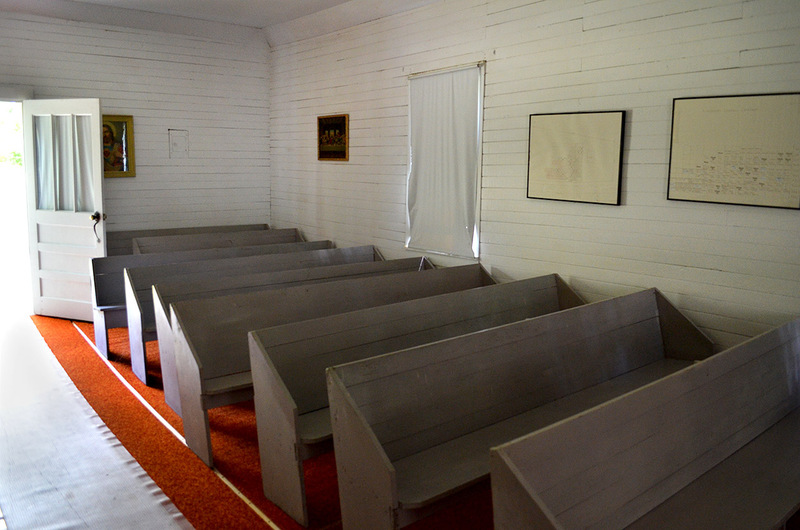 It was a simple country church with plain walls and simple pews, but the paint was fresh, the floor was clean and there wasn’t a speck of dust anywhere. The carpet and plastic runner added a jarring note of modernity, but they were functional. 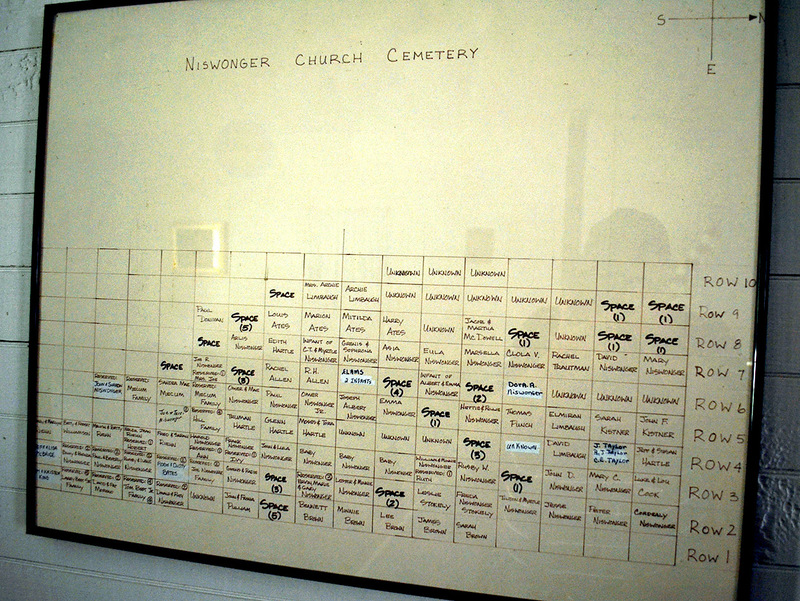 One wall contains a list of interments. If you are doing genealogical research, this could be a good starting point. FindAGrave lists 93 interments and says about 89 percent of the stones are photographed and / or containing detailed information about the deceased. I’m glad the farmer was on that stretch of road. 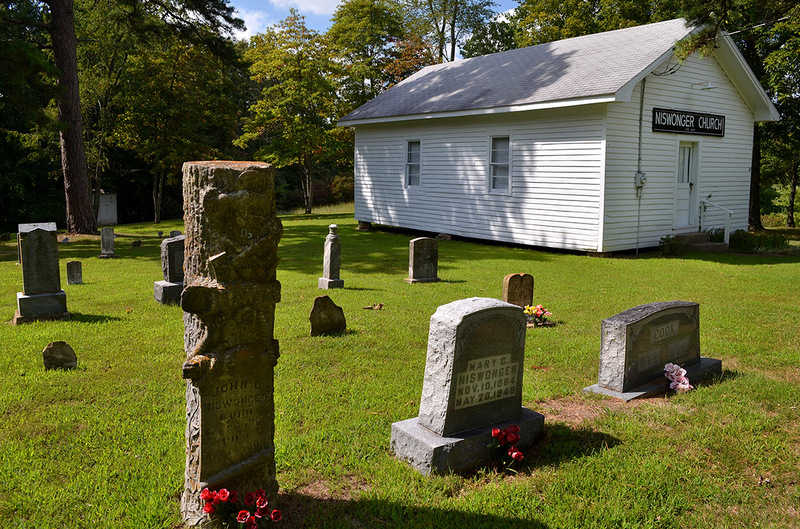 If he hadn’t slowed traffic down, then I probably would have whizzed right past an interesting church and cemetery in Cape County’s Whitewater Township. Our motorcycle group had a cemetery ride that challenged us to find headstones on a scavenger hunt list. This church and cemetery were used as one of the stops. I wish I could remember the unique stone we were looking for here. Fun stuff in the Halloween season. Liked the pictures and comments. 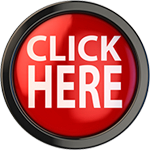 What a beautiful find for you. Lovely preservation as you stated. Someone loves the spot. Isn’t it wonderful to be able to look back and see something so simple and lovely! Wow what place..and close enough a for day trip and then custard at Andy’s in Cape when you get back. I wonder if this the same Niwonger’s for cape, Nancy and crew? The marker states that the Niswongers crossed the Mississippi on the ice, January 1, 1800. That is the same date and way that the George Frederick Bollinger migrants, also of Swiss descent, entered the Spanish Territory coming from North Carolina and they, too, migrated south to the Whitewater. I’ll bet this family was a part of Bollinger’s group but I do not have time to research that right now. It’s interesting how many of those original settler families still live in the area. Paul, I apologize if I’m telling you something you already know, but there is a book in the library at Marble Hill, “The Bollinger Connections”. It is a genealogy of Heinrich Bollinger Family (George Fredericks’s father). I believe it lists all the families that crossed at St. Genevieve on Jan. 1, 1800. If you are from around here you will recognize many of those names. I, too am a descendant of Heinrich Bollinger and found the book very interesting. I would love to have my own copy if I could find someone willing to part with theirs. You would be correct in your assumption. I am one of the descendants. The family formed a not for profit corporation to maintain and preserve this site. It is funded strictly by donations. I served as president of the corporation for a couple of years until I relocated to Florida. My wife and I were actually married in the church on November 24, 1990. As far as I know we were the last couple married there. The facility is no longer used for regular services. 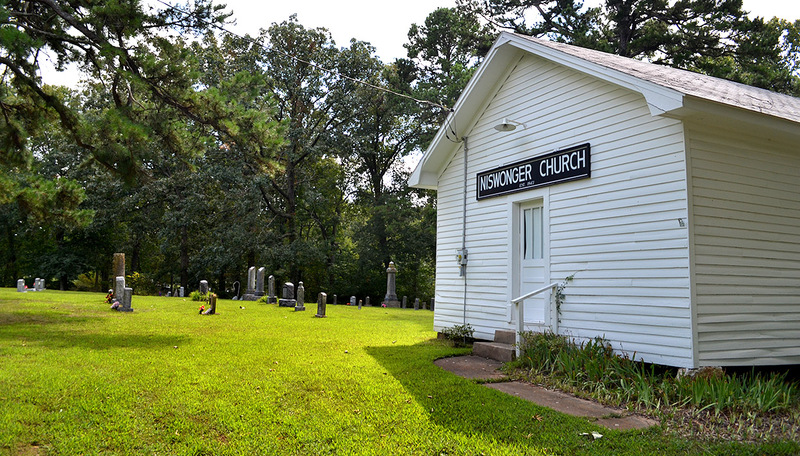 It is the site of the Niswonger reunion held the third Sunday of September each year. In fact it is being held today. My wife is there but unfortunately I could not be there at this time. 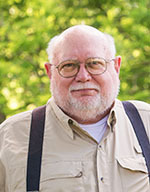 You can thank David O. Niswonger of Cape Girardeau for most of the historical information. I believe these are my ancestors on my mother’s side. We used to go to family reunions in Millersville and there were Niswongers and Seabaughs in attendance. Wish I had the book, Family Saga, in hand to check. I’ve sang many solos in that little church and enjoyed many reunions which tomorrow is one. 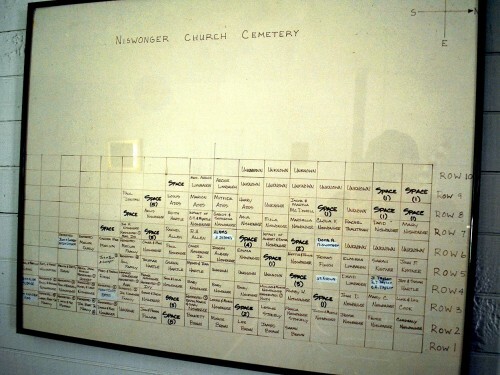 My grandparents were G.O and Raddie Catherine Niswonger who are buried there. My mother wa Mary Opal Niswonger Tallent. 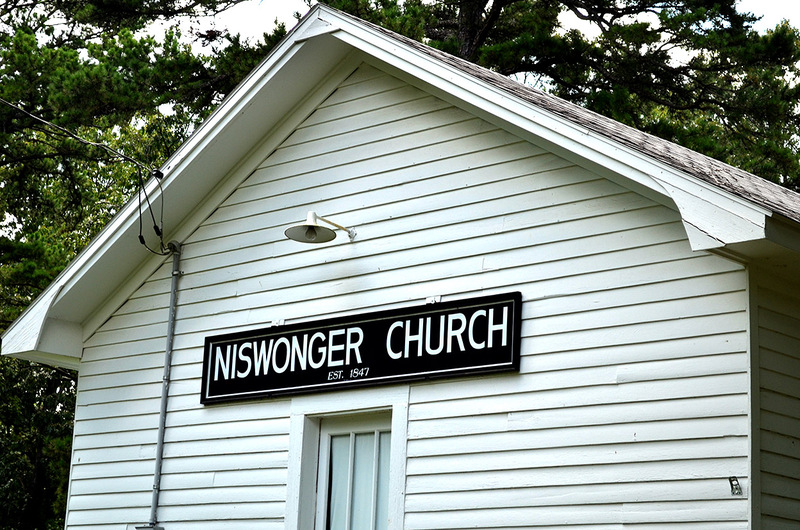 Sweet memories of Niswonger Church. Robert Cox,Thank you for your suggestion. I do have a copy of “The Bollinger Connections” but had forgotten that it listed all of those who crossed into the Spanish Territory with George Frederick. As soon as I get some time, I’ll look again at that book. George Frederick, in my view, founded the second settlement of Americans west of the Mississippi, at least in the central part of our country. Of course there were a few earlier settlements but they were Spanish or French most of them founded even before there was an “America” or American citizens. The Niswongers were no doubt a part of that. I find this story most interesting as I was ignorant of the presence of Swiss immigrants in the area as I had always assumed it was all German and Dutch with a little Scots/Irish thrown in. I don’t recall knowing any of the Niswonger family, but my dad who is 92 had friends who were contemporaries of his, identical twins Chester and Lester. If my memory serves me today, I recall that they were very large men, at least to me, and I heard a story that they weighed 12 pounds each at birth. I’m not sure how that could be possible, but it is either true or a small-town myth. If true, it should be in some record book or another. Thanks, Ken, for the continuing education. I’m sure I have heard my parents mention Lester and Chester. Glad to edify you. Just another day of history by accident. I enjoyed seeing this piece of my family’s history “pop” up randomly like this. So cool to see many find enjoyment in this historically rich land. The Niswonger family holds a reunion every year on the third September Sunday (yesterday), and this write up was discussed. I’m wanting to find out when it was that the church was discovered unlocked. It is not our practice to keep it unlocked, so naturally we were surprised to hear that it was found this way. Thanks in advance for your response and thanks for casting a beautiful light on The Niswonger Church. I’m glad you liked the photos. The first picture I made inside the church was taken at 2:05 p.m. on 9/16/2014. If it was supposed to be locked, I’m glad someone slipped up. I enjoyed seeing the inside of the building. That’s one of the things I like about SE MO: I’ve been surprised to find so many churches left unlocked. I am related to Juanita Criddle Niswonger. She is my mother’s sister. Robert Niswonger is the youngest son of Dallas and Juanita and is the father of the youngest man who posted this. I am related to Juanita Criddle Niswonger. She is my mother’s sister. Robert Niswonger is the youngest son of Dallas and Juanita and is the father of the young man who posted this. I’d appreciate if someone would check “The Bollinger Connections” to see if the Drum Family is listed as part of the group. Great pictures, as always, Ken. Our next chance to try and ‘hold you hostage’ at Old McKendree is this Sunday, September 28 at 3:00 p.m. Hope to see you (and others) at Old McKendree Day, celebrating the oldest standing Protestant church building west of the Mississippi River.